Grilling, it’s not just for meat anymore…. Technically these are not true spiedini since they are vegetable, but c’mon, the name just sounds hilarious. I try to make all of my grilled side dishes take 10 minutes or less to grill. That way I can cook them on the grill as the meat is resting. This is one of our favorite quick veggies during the week. 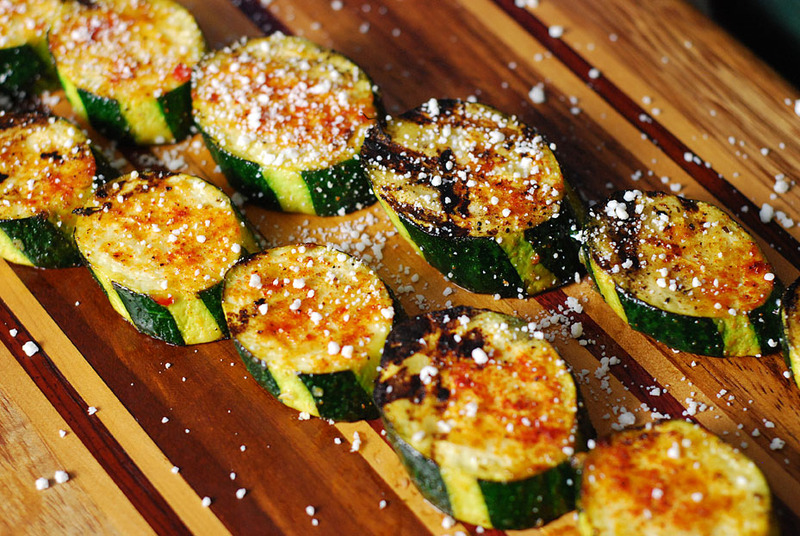 Cut zucchini into ½ inch slices. I like to cut them on a bias just for appearance sake but it’s not necessary. Place sideways on kabobs. TIP: To get the stripes like above, run a veggie peeler lengthwise down the zucchini in a few places before slicing. Marinate kabobs in the vinaigrette for 30 minutes. Remove from marinade and season both sides with season salt. Grill for 3 minutes a side over a 350f fire. Sprinkle with fine crumbled feta cheese or pecorino romano cheese. 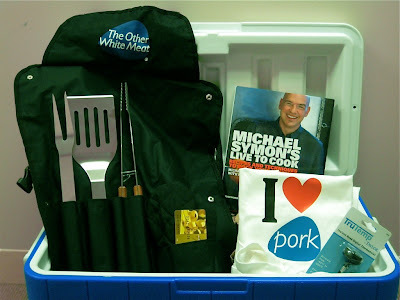 Also, it’s not too late to enter my May BBQ Giveaway over at Nibble Me This. You have until Saturday Night at midnight. It’s sponsored by Bush Beans and comes with all of these great BBQ and bean accessories. Yes, that includes the Emile Henry bean pot pictured. I recently participated in a Sweet Goodness Swap for Valentines Day. Their swaps are always so much fun. I made Michelle a bracelet with some of her favorite things; like inspirational charms, crowns and beads. As many of you know I just underwent surgery for ovarian cancer and so I used the turquoise colored beads in her bracelet to signify the search for a cure as a turquoise ribbon represents ovarian cancer. 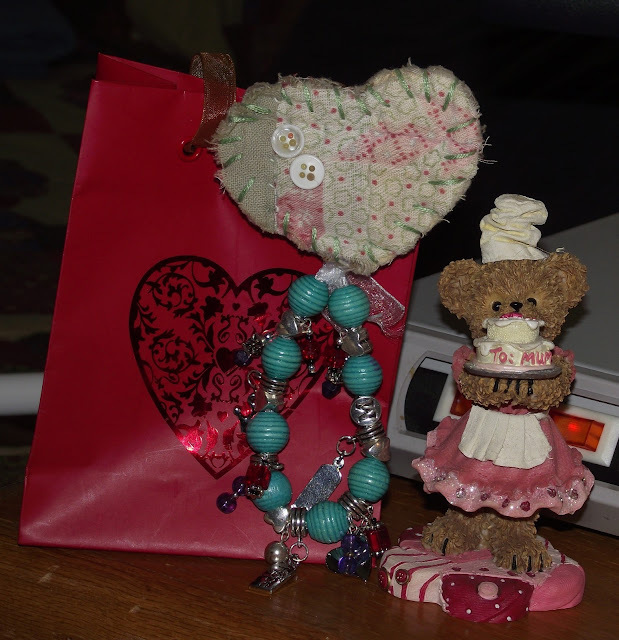 In the past Sweet Goodness Swaps there have usually been thrifted items as well as the hand made so I found this cute little bear baker figurine and quilted heart magnet for her bag also. I was hoping to receive hers to me so I could run these posts at the same time, but I’ve yet to receive mine so decided to run them separately. I recently participated in a Sweet Goodness Swap for Valentines Day. Their swaps are always so much fun. I made Michelle a bracelet (that also has a strong magnet backing that can convert it to a corsage) with some of her favorite things; like inspirational charms, crowns and beads. The turquoise beads I used represented the ovarian cancer surgery I was about to have as I made her gift. I was hoping to receive hers to me so I could run these posts at the same time, but I’ve yet to receive mine so decided to run them separately. 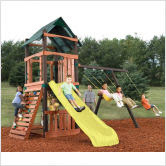 I’ve been searching for a swing set for my nephews, but I keep getting sidetracked with everything else CSN Stores has to offer. 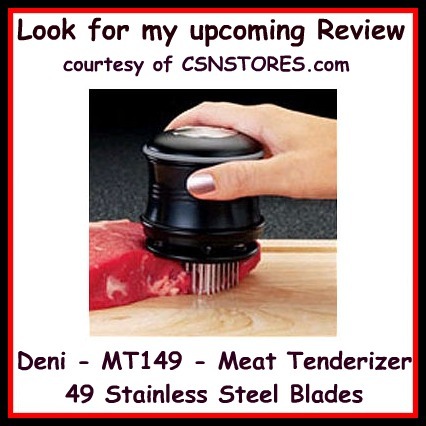 I’m also looking for cookware, cutlery and small appliances, so there is sooooooooooooooooo much to see at CSN Stores. My friend Marley over at CSN contacted me about doing a review for CSN Stores. How could I possibly say no with all of the wonderful opportunities they have given me to do reviews and offer you giveaways over the past year? Well, I couldn’t. This offer came at a perfect time for me. I am doing some reorganizing to kick off the New Year. CSN has the largest and finest selections, and their prices can’t be beat! Help me shop for cookware, cutlery and small appliances and earn a chance to win a $35 gift card to CSN Stores. You get an extra entry for posting an accompanying recipe link that you’d make with that item. Also be sure to head over to 3 Sides of Crazy & Always Eat on the Good China to see my upcoming reviews of awesome CSN products. IT’S ALMOST GRILL TIME ~ Watch for my upcoming review!!!!!!! It is almost grill time, and while we’re year round grillers despite the weather, many aren’t. 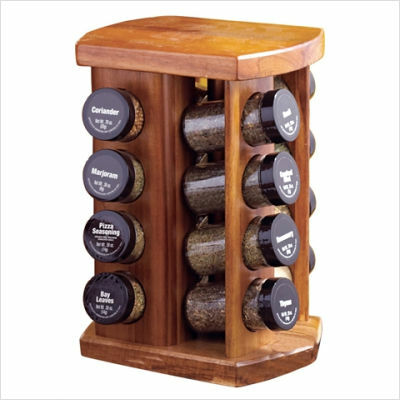 One of the best ways to add flavor to any meat is to use a tenderizer and seasoned rub prior to grilling. So I’m going to review this tenderizer for CSN Stores. Watch for my upcoming review. I am doing some reorganizing to kick off the New Year. CSN has the largest and finest selections, and their prices can’t be beat! 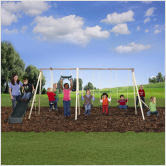 Help me shop for that swing set. Click the link above the photo and tell me which ones are your favorites. 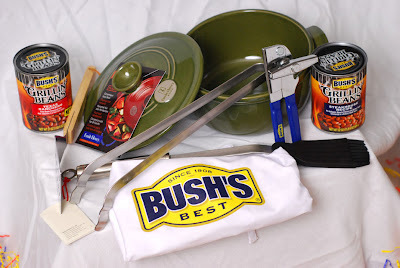 Also be sure to head over to my food blog, Our KrAzY kitchen for a CSN Giveaway! It’s Fire Day Friday but you can make this one in your oven too. It’s just not as fun. I was sitting at my desk at work reading government guidance about performing IT risk assessments (exciting stuff, really) when the idea of this dish popped into my head. 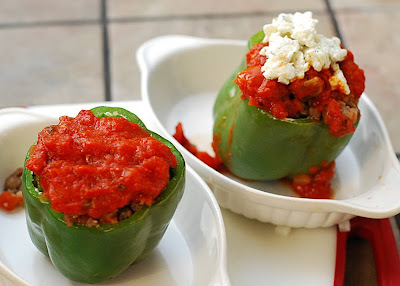 I love stuffed bell peppers but they have always been the traditional ones stuffed with a rice and beef/chorizo mixture. But before I get into that, check out the giveaway package that Robyn is running over at Grill Grrrl. As if the autographed Michael Symon book isn’t good enough, she’s throwing in all of this other great stuff! So get over there and enter. Okay, back to my idea. 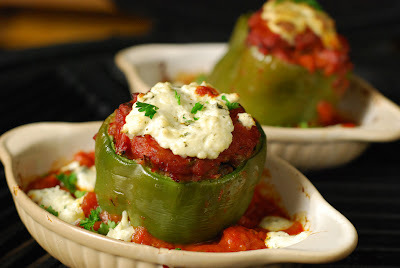 I thought that I would make stuffed peppers but make them with an Italian influence. 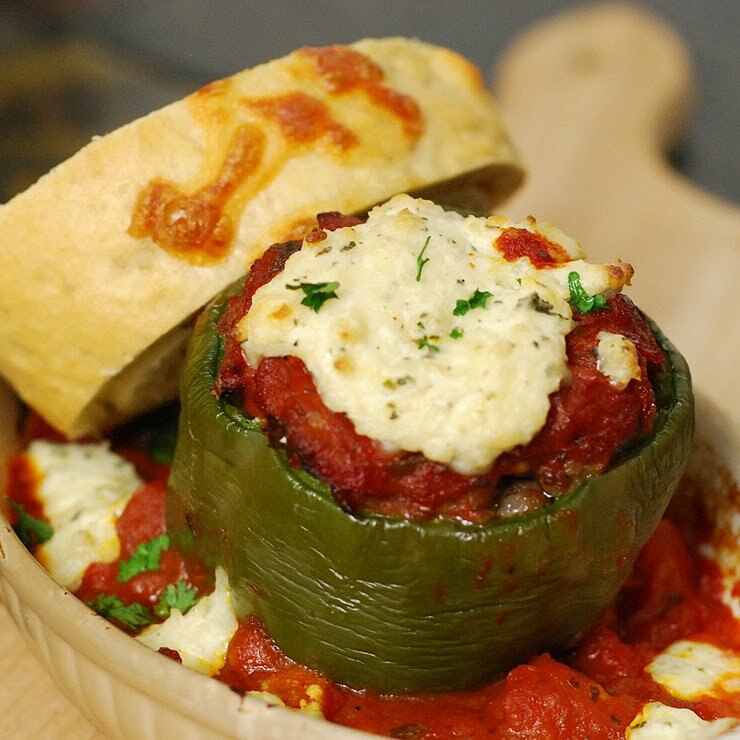 Kind of like a lasagna inside of a bell pepper. Since this was a total off the wall idea, I only made two of them in case they sucked and made our Italian Skillet Slop for the boys. Cut the tops of the peppers off and remove the seeds. Parboil them for 3 minutes, remove and drain. Cook the pasta and drain. 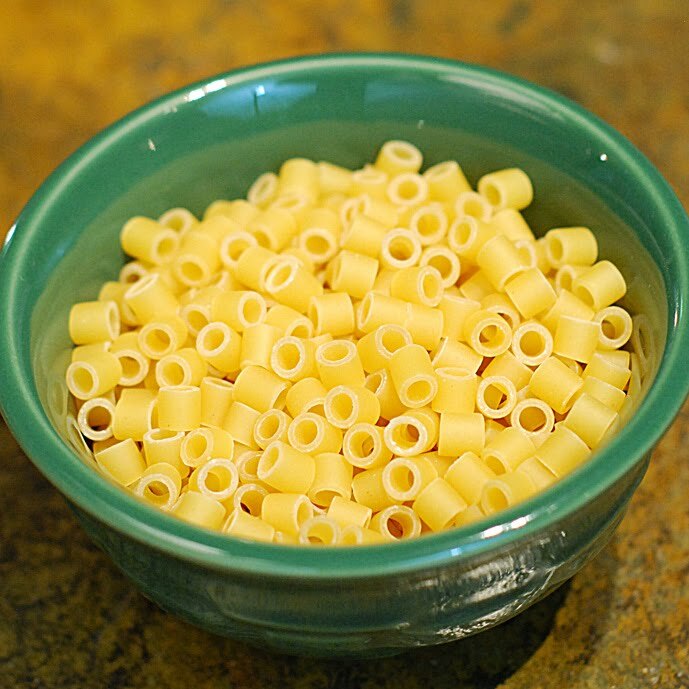 Ditalini is a small pasta (see pic below) which works perfect for this dish. Mix the cream cheese, mozzarella, and basil together. I would have used ricotta cheese instead if I had it but the cream cheese worked. 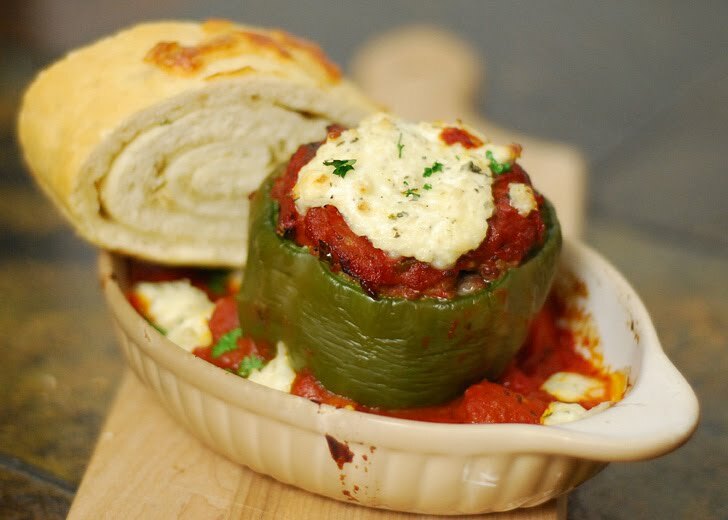 Now assemble your stuffed peppers in layers like this. A few tablespoons of pasta, about 1/4th of the cheese mixture in each of the two peppers, the sausage, and a few tablespoons of the marinara sauce. Feel free to use your favorite marinara or jarred marinara. I made a quick one. Sauté the garlic for 1-2 minutes in the butter and oil. Add the remaining ingredients and simmer for 30-45 minutes. I hit them with the immersion blender about 30 minutes in. Set your grill up for an indirect heat cook at 350f (or put in a 350f oven). Put the peppers in a casserole dish or individual baking dishes. I wasn’t sure how this would turn out so I put some of the cheese mixture on one of them and was going to add the other one later. I baked them on the Big Green Egg for about 20 minutes. Then I added the cheese mix to the other one, put the rest of the marinara sauce in the boats, and tossed in the last of the cheese mix on that. Meanwhile, Alexis was cooking another garlic bread roll on her Egg. We got this recipe from Rex at Savory Reviews. 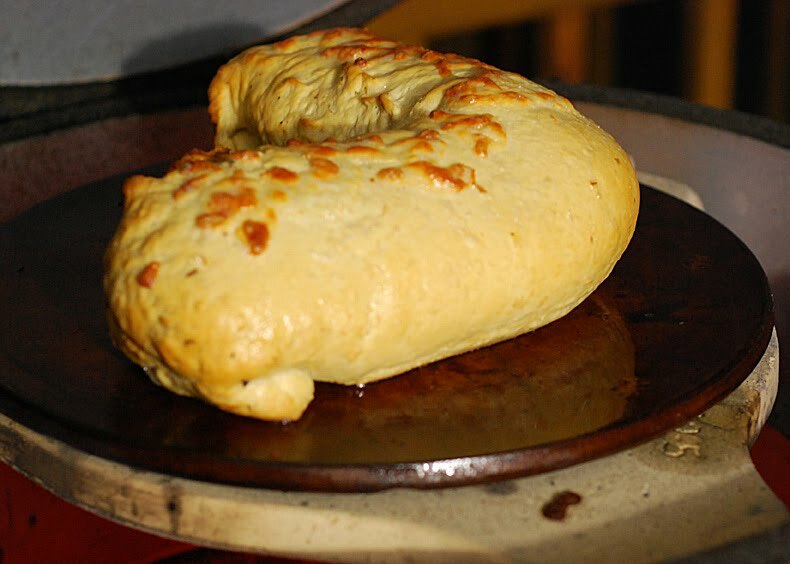 We had to bend it because it was too big to fit on the pizza stone. That didn’t affect taste at all. I cooked the peppers for about another 15-20 minutes and then took them off to serve. These worked great as a concept and was a very good dish. But this is more of a technique than a recipe. You could do the same idea with any of your favorite pasta and sauces and it would come out wonderful. Just doing this technique with leftover spaghetti would be great too. 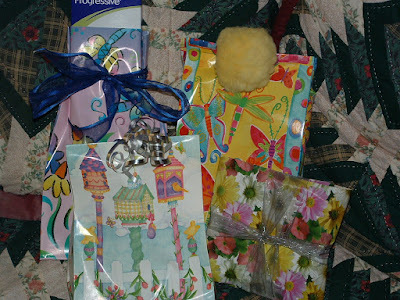 I once again participated in one of Mamarazzi’s swaps! In this one, we were supposed to send our partners things that we consider “guilty pleasures.” You know, things like your favorite bath oil that you only splurge on once a year, or an expensive cooking tool, or your favorite chocolate… What are your guilty pleasures? My partner was Kathleen from Measuring My Life in Love. She sent me this wonderful group of goodies. 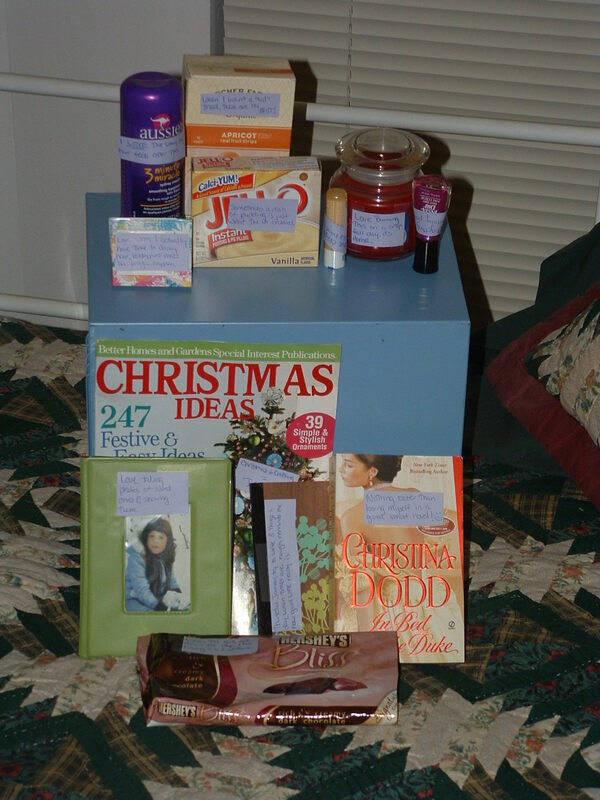 There is a new Christmas Idea Magazine, a thankful journal, a photo album, a romance novel, an awesome apple candle, sweet smelling milk and honey chapstick, Aussie 3 minute miracle and bobby pins to do my hair, Apricot leathers – yum!, Chocolate Bliss, vanilla pudding and some fun purple nail polish that I’ll use next week with my pedicure. I had already wrapped these when I realized I had not taken a picture yet, so you have to imagine the insides of these packages as I describe them. To me guilty pleasures means things I wouldn’t normally buy myself, but are seriously on a “want” list. My life is so hectic that there is never any “pamper me time” so the Bath and Body Works Bubble Bath is a true guilty pleasure for those long, but far and few in between bubble baths. I hate my feet or hands to get cracked from the hot summers or the cold winters and the Burt’s Bees salve is so soothing and calming to the skin. Because of my hectic life the key chain with the pictures is something that I can look at throughout the day to remind me of who I do it all for. The baking mat is PURE guilty pleasure. I have never burnt a cookie since I started using these mats so it’s a 2 fold guilty pleasure since I have to make cookies to make this one work. The oval frame I just saw and thought was pretty. And the Winner of the CSN gift certificate is…………. Tammy of Queen Size Funny Bone! Just to remind you, CSN Stores has over 1 million products and that number is constantly rising. Not only is their product catalog growing but they’re adding new stores like www.luxebycsn.com. You can literally spend all day looking for the perfect product at CSN.stores. Thank you CSN.stores for being so generous to the blogworld and allowing help spread the word. as she wishes at any of the CSN.stores websites. Disclosure: I did not receive any type of compensation for this post. CSN stores is sponsoring this giveaway and will handle prize fulfillment. All opinions are my own and I was not influenced to post them. It’s my birthday soon and CSN wants to give you a present to help me celebrate! so it’s GIVEAWAY TIME at 3 Sides of Crazy! I love shopping online with CSN and you can too. It so easy and they have so many wonderful name brand products to choose from. Whether you are looking for a Corelle, TV stands, dining room furniture or cookware they have it all. How can you win? By joining this giveaway of course! as they wish on any of the CSN.stores websites. THE RULES ~ leave a comment for each entry with the link. Answer one question – What is your favorite holiday recipe? Go over to their new site, www.luxebycsn.com and tell me your favorite item. You can earn an entry by linking that recipe here. You can earn an extra entry by blogging about this contest. You can earn another entry by becoming a follower of OUR KRAZY KITCHEN. You can earn another entry by becoming a follower here at 3 Sides of Crazy. You can earn another entry by becoming a follower here at Always Eat On The Good China. No entries after 11:30 pm Pacific Time Sunday, September 20th. Winner will be selected at random and announced Monday, September 21st.